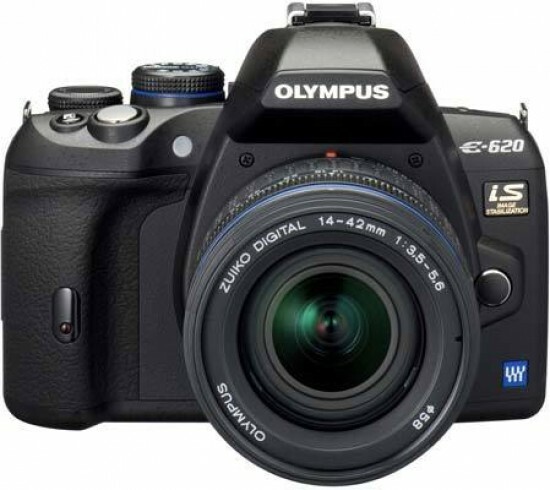 The Olympus E-620 offers the most effective combination of features, ease-of-use and price of any Olympus DSLR camera to date, and it's also a real contender for the Best Mid-Range DSLR crown. The E620 is a compelling all-round package that will appeal to beginners and more experienced users alike, with a compact and lightweight yet fairly robust design that comes with a lot of features for an entry-level camera. Borrowing features from both the cheaper E-450 and more expensive E-30 models has resulted in the E-620 hitting the sweet-spot between those two cameras. The icing on the cake is the inclusion of built-in image stabilisation, ensuring that every lens that you use with the E-620 benefits from this system, and the free-angle LCD screen which makes image composition much more versatile than with a fixed screen. Dedicated buttons for changing the focusing mode, ISO sensitivity, white balance and metering mode, the 7-point auto-focus system and relatively large, bright viewfinder are also very welcome features that the E-450 notably lacks. It's not all good news though - that old bug-bear of Four Thirds cameras, namely easily visible noise at higher ISO settings, rears its ugly head once again. The E-620 is no better or worse than its stable-mates in this respect, but it doesn't compare well to its main rivals from the likes of Nikon, Canon and Sony, which all offer better low-light performance from their bigger APS-C size sensors. The other major omission is the lack of ability to shoot video. Admittedly you have to pay more for the Canon EOS 500D or Nikon D5000 to get this feature, but it may just persuade potential E-620 owners to save a bit harder and spend a bit more elsewhere at a time when video on DSLRs is being heavily pushed as the next big thing. If you don't want to use your DSLR to record movies and you don't do very much handheld low-light shooting, then it's very easy to recommend the Olympus E-620, so much so that we've given it our highest possible Essential! award. It's one of the cheapest and most full-featured mid-range SLR cameras, with great ease-of use, compact size and light weight, and excellent image quality in good light. This camera certainly lives up to its official billing as "The Olympus E-620: All our knowledge in one", and is our pick of the current range of Olympus DSLRs.